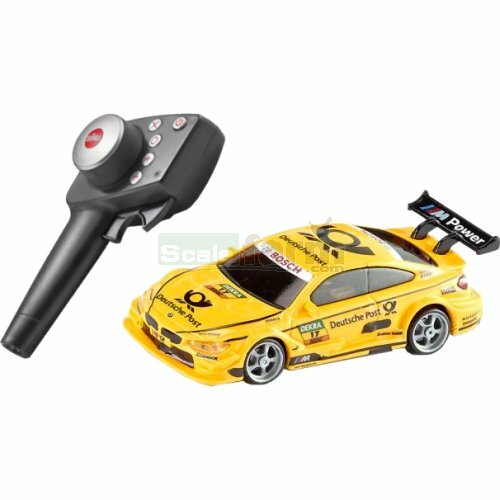 On your marks... BMW M4 DTM racing car with 2.4 GHz pistol grip remote control. Proportional and precision steering makes it suitable for any race track. Digital proportional speed control with one drive and one servo motor. Bright LED headlights and rear lights, three different tyre sets and a 4-gear shift to let you reach top speed. Set includes: car (SIKU 6836), battery (SIKU 6805), USB charger (SIKU 6806), pistol grip RC handset (SIKU 6899), interchangeable tyres (SIKU 6807).